I’m sipping Michigan Cherry coffee this morning and trying to wrangle cats over here. Anyone who says producing is easy is lying. We might make it look easy at CDI but it isn’t. Well the raising of funds isn’t. We have a good deal of funds committed to our next film endeavor LOST HEART but we have a little to go. It is hard because you cannot just advertise that you are looking for investors in violation of SEC laws which most filmmakers are unaware of. Also getting investors to understand the timelines and how you’re trying to make windows work. In Yuma, AZ it was the desert and the fact that past a certain point it was 100-120 degrees. In Michigan shooting especially up North its dancing around Memorial weekend and the 4th of July weekend. The schedule of stars and key elements required. I am eager for the studio production deal. I have a few that are in talks and that would essentially have us producing with studio money whereas they own the copyright. I’m game for that if it means not having to slog through the funding process every time. EVERY independent filmmaker knows this issue. 99% of the contact with filmmakers is that have an idea, maybe a script but not the funds. They film on spec, they attend a slew of festivals in hopes of enticing that distribution deal. I use to do all that and it is hard. The festival trail is the Oregon Trail of indie film and the trail is littered with the bones and buried bodies of artists who had big dreams. I’ve made it to the middle of the pack whereas no more festivals required to lure the distribution deals. But the next step is even more exciting and we are getting close. But that said, it is still hard. I’ve learned to look at a story in a deeper spiritual way – that it will be what it was meant to be. The artists that were meant to be involved will be. If someone steps out of the flow that creates an amazing opportunity for new artists. I’ve been the replacement actor before. I like to keep teams of artists growing and evolving but again it is hard to launch a project. We do it often but every one of them has been a task, painful at times. I have joked on the last few projects at the hardest times, that I should just tend bar at the Moose Lodge down the road. I have some great stories that I could share for years with the patrons playing KENO and sipping suds. Moving towards Easter we have a few films to talk about but this was a neat discovery. The film I helped produce and costarred in years ago BOOK OF RUTH, Journey of Faith is in one of my favorite midwest chains – Meijer. A good time to pick up a copy for your DJ Perry collection:) I saw it right over on Lake Lansing yesterday when picking up some ink. Our Easter film THE CHRIST SLAYER is heading to select theaters with myCinema on April 19th. If the big screen is not your thing or getting out and about is hard, you can rent/buy on digital streaming or DVD now on various sites. We hope the film is made available to many more of you. Contact your theater and have them book via MyCinema! If you are going to Easter treat yourself and your family by watching The Christ Slayer you might as well watch FORTY NIGHTS and CHASING THE STAR also. Again a great review of THE QUEST TRILOGY which includes all three films. I’m going to close here. it was a great week of business and getting things cleaned up about the yard. I’m ready for the snow to say its final goodbye. Today my college MSU has a big game so I’ll likely be watching that. Good green! Keep chipping away at your goals and dreams. If it was easy everyone would do it. Talk at you next week. WOW! What a trip. I’ve been going out to LA since the 90’s when I was first invited by Wes Craven to come read for SCREAM 2. From those humble beginnings to standing on the stage before a mighty gathering of industry folk at the Burbank International Film Festival accepting a best film award with our tribe representing the mitten state. I’m speaking of Wild Faith, our mid-western. It was nominated for BEST actor, actress and film. We did not take the other two awards but without Shane & Lauren’s chemistry we would not have won that award. That said, my ears were not filled with Hollywood smoke-blowing it was all sincere comments from people who laugh, cried and came into our 1875 Michigan world. The film is FUN with a message to ponder throughout it. The film gives a message like THE WALTON’S did or LITTLE HOUSE, I heard so many happy with the wholesome programming. Don’t get me wrong, I like my BLACK SAILS, GAME OF THRONES and such BUT when I do want something more tame it is often hard to find. I think WILD FAITH is a good response to that demand. This week I will be working on the home video deal. We still might have a few more theatrical/event showings. It plays so good at the theater. Great comments on the sound design, lighting, camera work and music as well as the performances. I got to see old friends and make new friends. I got to really get to know people like Darby Hinton, his beautiful wife Shan and son Ryder who hosted our BBQ afterglow at their home. Often when I see people on set I’ve got a character looming right behind my eyes waiting to hear ACTION. I have accounting and checks payable on my mind. And lastly I stay focused and not distracting to the difficult task at hand. If I goof off that’s a green light to others to goof off. That wasted time adds up and production pays. Sun down and missed last set up. After 12 hrs people start losing their peak performance. I guess I’m saying it’s fun to mingle without the burden of production. I had one meeting with an esteemed peer I’ve known for 19 years. He was so surprised at my humor and laid-back nature. He thought I was ultra stern and conservative. I can be but that’s not my natural state of being. A close actor buddy whose been on several adventures with me – Amsterdam, Mexico…list goes on. He got a pass from the wife and kid to come hang a couple of days. After watching WILD FAITH he said he really enjoyed it and was happy that I was sharing more of ME via Ben Lily. He claimed that ole’ Ben is the closest to DJ Perry in personal mode. Ha! Anyway. See WILD FAITH and despite what you might hear about me, not knowing me. Ole Ben Lily is pretty close to an 1875 DJ Perry. We have different speaking voices because I had the better edgy-macation. MBF – I will be releasing another screen still. I have to catch up with director Tony Hornus and check on editing. He stayed in MI to work after his overseas family vacation. The Christ Slayer – I’m going to check with our distributor to see if any artwork is underway for the DVD. That release will be 3/4/18 with digital a few weeks earlier and we’ll do a limited theatrical release before that. This holiday I’m going to push for folks to watch part 1 FORTY NIGHTS & 2 CHASING THE STAR of THE QUEST TRILOGY to catch up for the part 3 THE CHRIST SLAYER release. If you haven’t watched them please do. You can leave review comments on amazon or IMDB – or not. To circle back to the CA trip I want to thank so many friends for attending the screening or any of our gatherings. How cool is THE PIG N WHISTLE? Go there, it is awesome! Shepherds Pie and pints:) I loved seeing circle of friends melding, mixing, laughing and bonding. I love seeing that on film sets. It’s a secondary goal to finishing on time and budget. The ugg part was how long I’ve known many of you. 15, 18, 20+ years! Crazy! I say to you, make good friends and value those relationships. I’m just so grateful to have friends in an industry who allows this artist to feel part of the greater game despite my adherence to my MI zip code. My family, friends and roots in Michigan are my recharge and nourishment. But I will return again soon on business to visit the sunny, smoggy:) California! PS: I will be posting more CA pics this Sunday. Have a great week and be good to one another. I’m sipping on the hazelnut coffee and enjoying the sunshine this morning. Welcome readers from Finland – happy to have you here with us. So I returned on Thursday from my trip to LA. I had been wanting to return to LA to see one of my dear friends who now has a little one and wife. Several times I had debated taking the time to go visit but I’ve been in production or post-production for a few years now. Busy does not stop it just keeps going. Well I received an invite to a private family memorial for my friend, mentor and co-star Rance Howard. Rance has always been that voice of truth in an industry that often moves on lies and half-truths. He was a mentor/friend that often felt like a grandfather. He was a script consultant on a WW2 Christmas film I wrote. He was my co-star on several films including THE CHRIST SLAYER that will release to theaters on the run up to Christmas this year. I know that EVERYONE who met Rance loved him. I did not plan on any invite and knew nothing of the planning. I felt fulfilled and secure in the memories of the beautiful relationship we had shared. When working on a role Rance and I were like two ten-year olds playing. His wisdom was always a guiding force and I was content with my quiet prayers to a friend who passed. Weeks later I was surprised to get an invite from his sons to attend a private service. I did not want any stress/expectations around this event as the purpose was to celebrate a friend passing not business. So I quietly left in the middle of a massive snowstorm to say goodbye to an old friend and to visit another friend with new child. Circle of life. To say that is was a nice tribute would be an understatement. It was a true look back at a farmer’s son who had an undeniable urge to be storyteller. The odds of this small town young man finding success in the industry were very small. I was his friend for a dozen years but I met many who had that gentle guidance for a lifetime. I realized just how blessed I was to have Rance in my life. One after another – family and friends stood up to speak of the qualities of this great man. To hear sons, grandchildren, directors and fellow actors tell their stories of how Rance touched them was beyond moving. To have an opportunity to speak with his family and friends and share my stories of Rance and our relationship was beautiful. I know that Ron posted some pics and video of the tribute on his official Facebook so you can visit there. That’s what the family felt like sharing. It was interesting to hear the “family story” behind stories I heard from Rance and Judy directly. Johnny Depp retold the story Judy Howard had told us of her trying to convince Rance not to jump from a train at 80+ years old. She tried to get Johnny to talk with Rance but the long/short is Rance did it anyways. To be able to tell the family directly what their father meant to me was powerful. That day remembering Rance is one I will remember for the rest of my life. I got to hear some wonderful comments on our art. The family all knew about our films because Rance had grown a beard, which they lovingly teased him according to Judy. He kept that beard until the end of his life telling me he hadn’t had one in many years but he was enjoying the freedom of it. I was pushing him to go play a Jedi Master. I’m sure his family was also aware of the management/rep craziness when Rance told the X Files producers that a certain shoot date would not work because of Forty Nights. Knowing agents like I have – I bet that was one giant rant of “What the @$#@#% is Forty Nights and who in the hell is DJ Perry?” – He ended up doing both because he stuck to his commitment with us (never in question) and that was that. A free lesson for all of you out there. Don’t have someone’s back only until something better comes along. The “trade up” mentality is a common thing to starving talent who will climb at all cost. But as Rance once said, “if the cost is your integrity – you can’t afford it.” Free advice from one of my great teachers. I will miss my friend and I’ll be always grateful for the stories we told together. Now two days prior to my travels, our final film of WILD FAITH had been completed. Over the past year I depleted energy like everyone else in this hard industry. Often taking three steps forward and getting knocked back two. Raising money is always hard and executing with ever-growing expectations is even harder. But at that memorial I took stock of my own path and journey. I turned around and looked at where I started and where I’ve been. Who I’ve worked with and what we created together. And the most exciting revelation is looking ahead visualizing what I will work to create in the next dozen years. I spent the balance of the trip visiting with friends laughing, recharging and reflecting. I came back home ready to do what I do. Create. So I’m working hard to widen our investor base so we can create more often. The demand is there for our content and so we’ll work hard to fill that demand. We’ve signed our first theatrical deal on “Wild Faith” at Celebration Cinema and we’ll release the show dates in the next few days. I’m very excited to see this play in the theaters and I’m just so damn proud of all the artists. The talks on home video and TV series are in full swing. I would love to have the TV show move ahead because many Michigan talent would get to be part of this beautiful world. “Forty Nights” and “Chasing the Star” enjoyed a great Christmas season and I’ve been working with BMG on paperwork for additional foreign sales. BMG entered “Chasing the Star” into a few select festivals. I’m a person who likes to just target a few festivals. They take time and energy and often I just choose to direct that energy towards deal making. So our distributor plans to make part 3 of Collective Development Inc.’s THE QUEST TRILOGY “The Christ Slayer” their flagship release at the upcoming markets. They got the sneak peek at the soon-to-release theatrical trailer and poster art. Additionally the hype over Mel Gibson‘s development of a sequel to The Passion of the Christ has been encouraging. That proposed film focuses on passover and the days that follow Jesus rising from the tomb. That is exactly the time period and event we focused on with THE CHRIST SLAYER. A final story filled with incredible performances by everyone including Rance Howard shining in one of his last feature films. So I agree this “piece” of the Jesus story is unique and audiences will be able to see our take a good year plus before the other film is set to release. I will be excited to see their take on the story as Jim does an awesome job as Jesus and Mel is one of my favorite directors. Audiences will be able to enjoy our film in theaters leading to this Christmas and home video leading up top Easter 2019. I’m going to let all of you see the theatrical poster HERE before the PR release this week. I want to also wish a happy birthday to Shane Hagedorn and Anthony (Tony) Hornus – two tribal amigos who share a special day. I’ve created much with both of them and look forward to many more. MBF is growing with more support and I’ve got a few talent I want to approach once all funding is locked. I’ll be back to that this week. We’re getting close but do not start anything you cannot finish. Exert patience and get everything proper with your ship before taking it out to deep waters. So to proposed cast and crew know we’re working hard to allow us to tell another great story. I also want to take this moment to thank Shane Hagedorn. I’ve been very busy the last few years. And you filmmakers know the films are like your children. So the films have gotten strong marketing but I have not really pushed my own acting. I’ve had no time to cut any character reels. Shane was kind enough to Christmas gift me with a ‘Jesus’ reel cut from “Forty Nights”. Now when you’re in 70+ min of an 88 min film picking the best 2-3 min can be hard. I’m appreciative that he did that for me. Now if you have not yet watched “Forty Nights” DON’T WATCH the reel. Go to Amazon and watch the film first. But I will use this reel to discuss future work on other projects. I’ve recently had a few west coast projects in my orbit picking up speed. I had a few new updates on C.U.J.O and the western RIFLE development. I cannot speak on these publicly but I hope they both launch. They will be great fun. A few other projects with Reel Frog (Book of Ruth) are advancing on the development board also. An animated venture is coming together piece by piece. Overall 2018, the Year of the Dog (My sign) is upon us. I will keep my tail wagging and trotting along. WICKED SPRING should appear for streaming on 3/1/18 like VUDU, Amazon Prime, Hoopla and more. Please do check out this powerful film that we produced 18 years ago. THE ACTOR – I’m hearing April release. PATCHWORK GIRL OF OZ (Animated for Children) – On Vimeo On Demand and coming to Amazon. I’m going to sign off and go pour a last cup of coffee. It feels great to be back in my home state and I’m ready to show audiences our new films this year. I’m ready to work hard as usual to make new content. I tip my hat to all of you out there working hard. Do good business. Make an environment to create great art. An actual TRILOGY trailer is being worked on. “The Christ Slayer” VFX is doing great. I got to see some of the work involved in the VFX work. The scene they are working on is the crucifixion scene. We’ll be rolling more out on this once we get “Chasing the Star” launched into the marketplace. We’re also putting the deal together for a church theatrical program in Novasota, Texas. In Nov and Dec they will license Part 1 & Part 2 to show. I can see the days ahead whereas the trilogy will play back-to-back during the holiday season. Music work by the incredible Dennis Therrian continues. This month we’re going to push hard to finish the music and VFX. We had a good meeting with director Jesse Low to evaluate our final actions. Also the first poster is very close. I’m very excited about the potential of this film and beyond. Potential deals loom for “Ashes of Eden” and a classic “Wicked Spring” – the latter is the Civil War film we produced 17 years ago when I had a sister company to CDI called Lionheart Filmworks. It was created in VA with director Kevin Hershberger and was directed at historic content. I split several years ago and we took all rights to “Wicked Spring” in exchange for our holding in Lionheart Filmworks. I’ve been happy to see the success Kevin has had with his TV series Legends & Lies and such. It is a great story that will speak to this generation. The NEW Collective Development Inc. company website is weeks away from launching. The new CDI Youtube site phase one is up. It will be a great hub to find/buy/rent CDI content and merchandise. The TRIBE is on the move. This project now has the business foundation in place. We’re going to push hard to see if we can hit our target window to shoot. Our casting process has been on-going and we’ve seen some great talent from around the country. We’ll be making the announcement on our director Anthony Hornus this week. Also we’ll start rolling out some of the attached cast and crew. I’m beyond excited by some of the wonderful talent. Bridgestone Multimedia Group will distribute worldwide. So in summary, re-watch “Forty Nights” and watch “Chasing the Star” – please do leave online reviews and spread the word if you liked what you saw. I’m also happy to announce that the shake upper siding, (back and front) on the office are now installed. Just the cedar flash and rafters to go and the outside will be about done. We also had the first wood stove fire of the season yesterday. I’m ready to hit the ground running on Tuesday. I want to film this fall and that just may be in the cards. Be good to one another. Today is hot in Michigan. Low land India hot and maybe even Philippines hot but not quite Costa Rica hot which has twice the humidity and that is a LOT! The past week has been one of multiple projects moving forward. Some of the top developments of the past week. 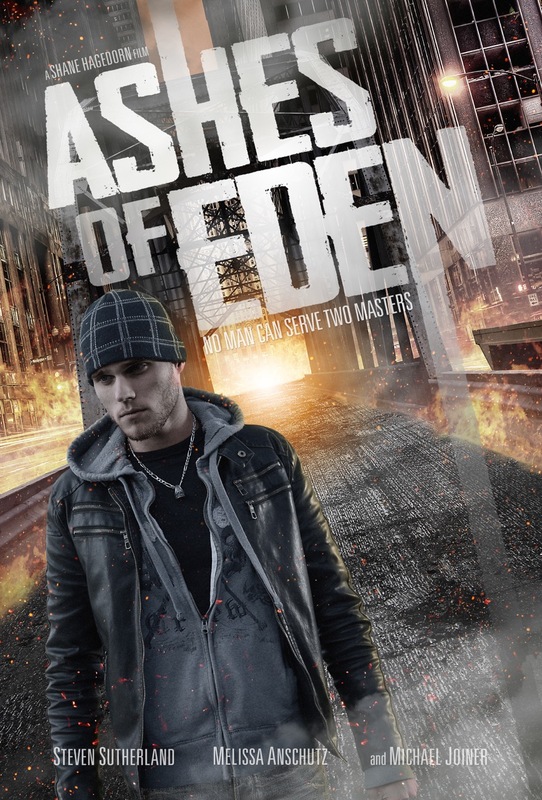 – ASHES OF EDEN was mastered for home video/TV worldwide. This mastering included a new CDI company logo that was created for “40 Nights” feature film. (Thank you Vroman Arts) This film releases Oct. 13th worldwide! – WASTELAND updates – the film short is being considered at many genre festivals that showcase Sci-Fi. Posters are soon to be for sale and the best news yet appears to be financing opportunities for the full feature. 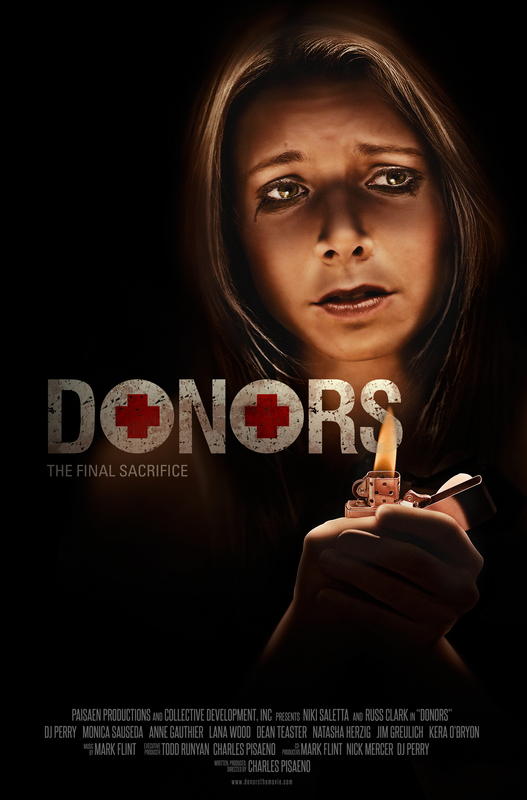 – “DONORS” the thriller about organ stealing has signed a domestic deal with Jax Distribution. They are also interested in several films from the CDI library. 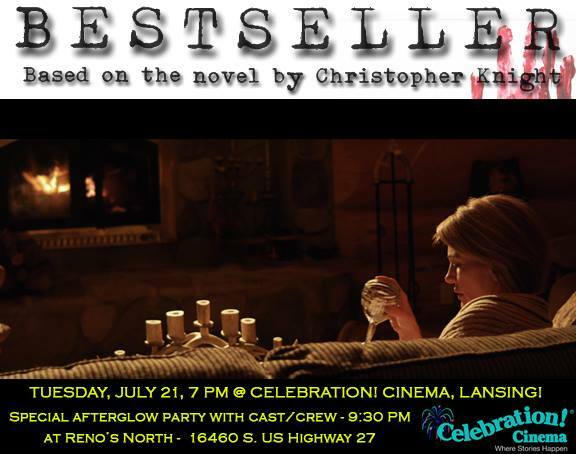 – “Bestseller” is about to have the Lansing, MI theatrical kick off running at Celebration Cinema from July 21st (Tuesday) until July 26th (Sunday) and we also released the behind the scenes from the media premiere. The 1st public premiere promo will be released here soon also. We are close to announce a few other screening locations. The 21st showing will have Chris Knight, author and EP at the showing and afterglow. Several of the cast and crew will attend the opening night show but we invite you to attend any of the showings and invite others if you like what you see. Keep requesting it at your local theaters. – “40 Nights” is CLOSE to revealing the 1st look trailer. We had a great music direction meeting with director Jesse Low and composer/sound designer Dennis Therrian. We discussed themes, instruments and exchanged ideas to be used in the trailer and feature. The feature itself is getting close to a lock and my goal is to have it over August 1st. The 2nd is the follow-up biblical faith film to “40 Nights” entitled “Chasing the Star”. It is to be shot in the Yuma, AZ area Jan/Feb 2016. We will be doing some advance casting on this project in the coming weeks. It will be distributed by Lightworx Entertainment. It is a late night Saturday blog. It will actually post in the wee hours of Sunday but today was full and kept me away from my computer. It has been a good week of film business. Most of the week I worked from early morning until about 2:30 or so before moving to yard work. I had such a wild week full of many emotions as projects moved to different phases. BESTSELLER coming off the sold out premiere started its run in Grand Rapids. That day leading up to the GR week of showings – had me feeling blissful. I had watched the 1st full cut of “40 Nights” the day prior. I was just stunned as I watched that film play out. It flowed so well and was moving in the performances and camera work. This was only a rough cut without music or sound – and what a great ending! I know what went into the shoot by the hard working cast and crew. It was such a good cut that if polished slightly it would be ready to roll into the next audio phase. We will do a few more test showings to get feedback and make minor tweaks. But I was so at peace because it was powerful to watch – even in this rough stage. I had a few great conversations about the film with people in the circle including our distributor. I’m excited to lock this edit by month’s end. BESTSELLER playing on the Celebration Cinema screen in 5.1 was cool to watch. Seeing an audience JUMP and GASP in terror was truly a wonderful experience. We had a Q&A after this kick off which was nice to interact with an audience after they watched the film. There were a few aspiring filmmakers in the crowd and their questions are always fun to answer. The night ended with fish tacos and so that is pretty good. Paperwork was exchanged this past week whereas CDI Distribution brokered TV license deals for OUTSIDE THE WIRE and STANDING POST for Red, White & Blue Non-Profit and also for the TV special – 7 STONES. We will be doing some official announcements but remember you heard it here first. I’ve been writing everyday – I’m reworking an older script, writing on two others and outlining our next biblical faith drama. I’ve been enjoying this time with coffee and imagination. I look forward to seeing some of these go to the screen. 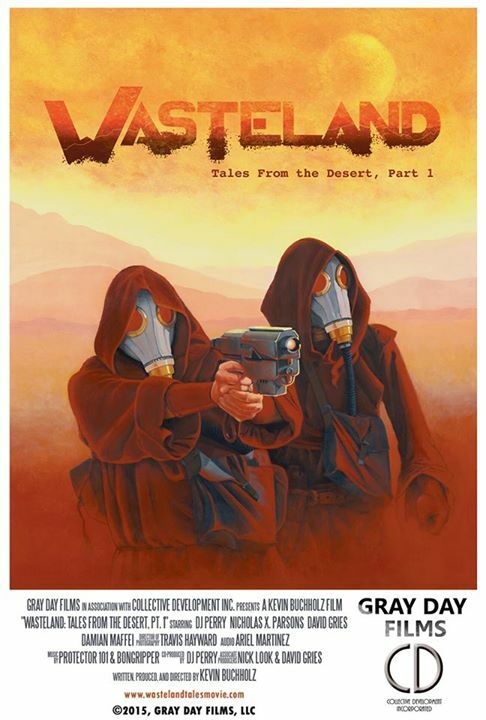 The WASTELAND poster is just downright cool as all get out. I’m looking forward to that hitting some festivals and shooting Part 2 in the near future. This Sci-Fi piece WASTELAND was so much fun to shoot. Recently, I considered being involved in another feature – a comedy but it was just bad timing. I have lots going on in June with writing, promotion, distribution and getting the garden and yard around. I’m also going to be an uncle this month again and our soccer season is in full swing. I will start some heavy developmental film work soon. I have to admit – the break after shooting “40 Nights” has been refreshing. As of today – the garden is now in and I did some clean up to the office porch. Productive day! We had a rain out on soccer last week and I hope we don’t repeat that again. I’m going to do a few last things tonight before getting some well deserved rest. Enjoy the rest of your weekend and have a productive week ahead. 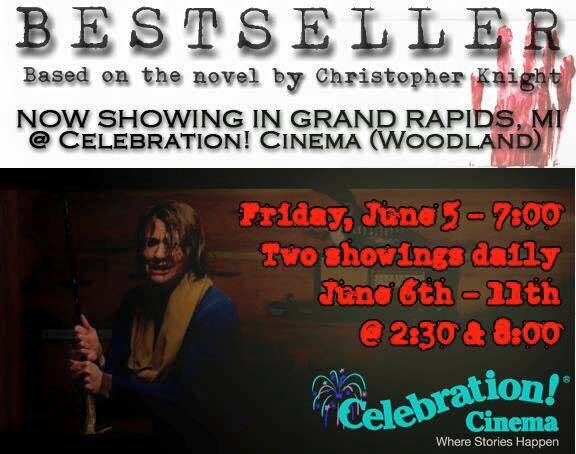 If you are in the Grand Rapids, MI area and want to check out BESTSELLER it plays twice a day until the 11th of June.